The autographed book by Mikhail Botvinnik finished on eBay on Sunday evening. It was a popular auction with some frantic bidding in the last 20 minutes that doubled the final price to £77. I'm really pleased with the way it went: I've had the pleasure of having Botvinnik's autograph on my bookshelf for a year, and made a decent profit on the deal. Whilst, the buyer has managed to pick up a wonderful book at what is still a very good price. 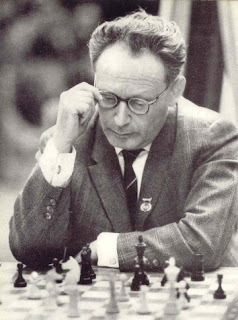 I'm also reassured to know that the book is going to a 'good chess home' and to a real fan of Botvinnik. This week I'm going to auction one of the most unusual but nonetheless fascinating chess books ever published. I'll tell you more later, but for now I'll give you a clue: the book, written by one of the strongest players of the 20th Century, only contains one game of chess. Can you guess which book it is?